The heart is a large muscular organ which constantly pushes oxygen-rich blood to the brain and extremities and transports oxygen-poor blood from the brain and extremities to the lungs to gain oxygen. Blood comes into the right atrium from the body, moves into the right ventricle and is pushed into the pulmonary arteries in the lungs. 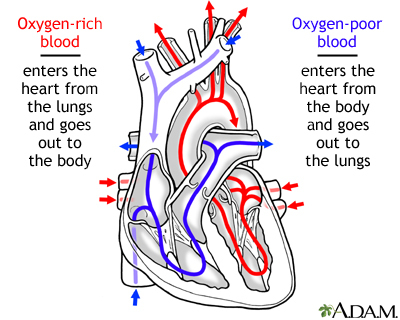 After picking up oxygen, the blood travels back to the heart through the pulmonary veins into the left atrium, to the left ventricle and out to the body's tissues through the aorta.